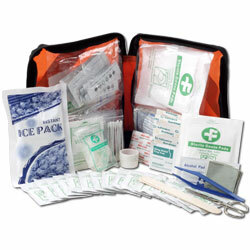 The First Aid Kit by Trademark Home is an absolute essential for your home or office safety! This 220-piece set comes fully equipped with everything you need to be prepared in the event of a full-blown disaster or treating an injury as simple as a scraped knee. With a convenient zip up case included to hold and store all of the medical supplies, this kit is travel friendly and perfect for home, car, or office. This compact kit is an essential for any survival bag or emergency situation! 15 packs of hand cleansing wipes, 4 large knuckle / joint bandages, 3 small knuckle / joint bandages, 4 fingertip bandages, 1 square bandage for small wounds, 100 bandages: .5 x 3 inches, 30 bandages: 1 x 3 inches, 2 rolls of medical tape, 16 70% isopropyl alcohol pads, 2 packs of 2, sterile 8 ply gauze pads: 2.95 x 2.95 inches, 2 bandages: 1.875 x 3.875 inches, 2 sting relief prep pads, 3 moleskin, 3 double sided non-adherent wound pads: 1.97 x 1.97 inches, 1 sterile abdominal pad: 5 x 9 inches, 1 pack of 2, sterile 8 ply gauze pads: 3.94 x 3.94 inches, 1 sterile eye pad, 10 double ended cotton swabs, 15 antiseptic swabs, 5 disposable forehead temperature strips, 1 pair of disposable gloves-large, 1 instant ice pack, 1 emergency blanket: 82.68 x 51.19 inches, 1 PBT bandage: 1.97 x 177.17 inches, 2 tongue depressors, 1 pair of scissors, 1 pair of tweezers, and storage case. 220 PIECE SET- This 220-piece set comes fully equipped with everything you need to be prepared in the event of a full-blown disaster, like an earthquake, or treating an injury as simple as a scraped knee at the park with the kids. INDOOR OUTDOOR USE- The first aid kit is perfect to keep in your home for cuts or burns, in your car for minor accidents, or for extra preparedness while camping, hiking, or any other outdoor activity. CARRYING CASE INCLUDED- With a convenient zip up case included to hold and store all of the medical supplies, this kit is travel friendly and easily accessible for emergency situations. THOUGHTFUL GIFT- The emergency kit is a thoughtful holiday, birthday, or graduation gift for any family member, new driver, or college bound student. Help keep your friends and loved ones safe anywhere, with this compact safety kit. PRODUCT DETAILS- Case Dimensions: (L)9”x (W)7.5”x (H)2.5”. 220-piece kit.